Isagenix Weight Loss Premium Pack - The Best Value Weight Loss Pack! The Isagenix Weight Loss Premium Pack is the ultimate for anyone focused on their health. This is the most popular and best value pack for weight loss. The Weight Loss Premium Pack (formerly called the President’s Pak) comes with a variety of products (outlined below in detail) that are designed to help you lose weight, strip fat and improve your inner health. The pack comes with everything you need including shakes, vitamins, snacks, cleansing products and a blender. If that wasn’t enough this pack includes a FREE membership to Isagenix (normally $25 with the smaller packs). 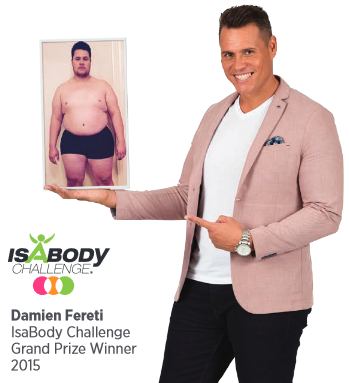 The Isagenix President’s Pak is the flagship of the Isagenix range. This is a fantastic way to help diminish the visible signs of ageing and promote healthy, sustainable weight loss. The Weight Loss Premium Pack includes Cleanse for Life (in liquid or powder form) to help your body remove impurities. When combined with the Natural Accelerator this will rev up your metabolism and speed up the weight loss process. Other products such as the IsaLean shakes provide a complete meal replacement, while the IsaLean bars can be used as either a meal replacement or healthy, filling snack. The Isagenix Weight Loss Premium/President Pack truly is the ultimate Isagenix nutritional cleansing pack, easily our most favourite and recommended here at IsaElite. There’s no need to go hungry with the Isagenix Premium Pack. With four cartons of nutritious and satiating IsaLean Shakes, 60 tasty Isagenix Snacks, a box of the delicious Isagenix Whey Thins, and one box of gut-busting IsaLean Bars, you have a complete snack and meal replacement package ready to keep you full, healthy, and satisfied. More than just scientifically formulated supplements, these and other products in the President’s Pak will curb your cravings and satisfy your taste buds day in and day out. 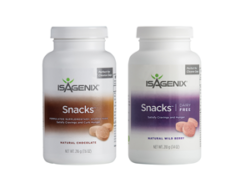 Curb your appetite with the Isagenix Snacks that help support healthy blood sugar levels. These can be taken on Isagenix Cleanse Days or on regular shake days. IsaLean bars, on the other hand, can only be taken on shake days. 4 x IsaLean Shakes – made up of your choice of Creamy Dutch Chocolate, Creamy Dutch Vanilla, Strawberry Cream, or a mix and match of each! Containing 14 single-serve packets per carton, each IsaLean Shake provides 24 grams of premium milk and whey protein and features a scientific blend of minerals proven to support weight loss and management. 2 x Cleanse for Life – Cleanse for Life rids your body of toxins and provides nourishment with a carefully selected blend of vital nutrients, vitamins, minerals, and antioxidant botanicals. The superior cleansing formula helps release impurities and adds adaptogens to reduce oxidative stress, energise the cells, and harmonise the body. 1 x Ionix Supreme – This nutrient-rich tonic is an all-natural stress reliever and contains essential minerals, vitamins, and botanical extracts to boost energy, increase stamina, and promote overall health. 1 x Natural Accelerator – Isagenix Natural Accelerator capsules contain green tea, cayenne, and a scientifically proven blend of vital ingredients designed to help your body burn fat naturally without the shaky feeling often associated with fat burners. 1 x Isagenix Snacks – Each container of Isagenix Snacks contains 60 tasty and chocolatey chewable tablets to curb hunger cravings and help maintain proper blood sugar levels. Feeling hungry or craving chocolate? Just pop an Isagenix Snack in your mouth and instantly feel satiated and ready for action. 1 x IsaFlush – Staying regular is vital for weight loss and a healthy gut. Isagenix IsaFlush helps cleanse your system and ensure normal bowel movements, allowing your body to digest and absorb more nutrients. 2 x Boxes of Eshots – This healthy, natural alternative to coffee is ideal as a pre workout or before a big day of work. Comes conveniently packaged in a single shot so you can enjoy this amazing energy source on-the-go. 1 x Box of Whey Thins – The latest snack in the Isagenix range! With 10 grams of fibre and a delicious cheddar flavour, these are a personal favourite of ours. 1 x Box of IsaDelight Chocolates – Choose your favourite flavour of Isagenix chocolates including the new sea salt and caramel! 1 x IsaLean Bars – Providing you with a nutritionally complete snack to help curb hunger, IsaLean Bars are loaded with whey protein, energising carbohydrates, and healthy fats. Plus, with flavours such as Chocolate Decadence, Chocolate Cream Crisp, Lemon Passion Crunch and NEW Nutty Caramel Cashew, these nutritious snacks taste great as well. 1 x IsaBlender – This bullet-style blender is perfect for mixing up IsaLean Shakes, smoothies, and a variety of other healthy concoctions. 1 x Instructional Booklet – with easy-to-follow directions for a weight loss or healthy maintenance program. 1 x FREE 1-year Membership – normally $25 on the smaller Isagenix packs. 1 x $50 Event Coupon – valid for any Isagenix business event throughout the year. 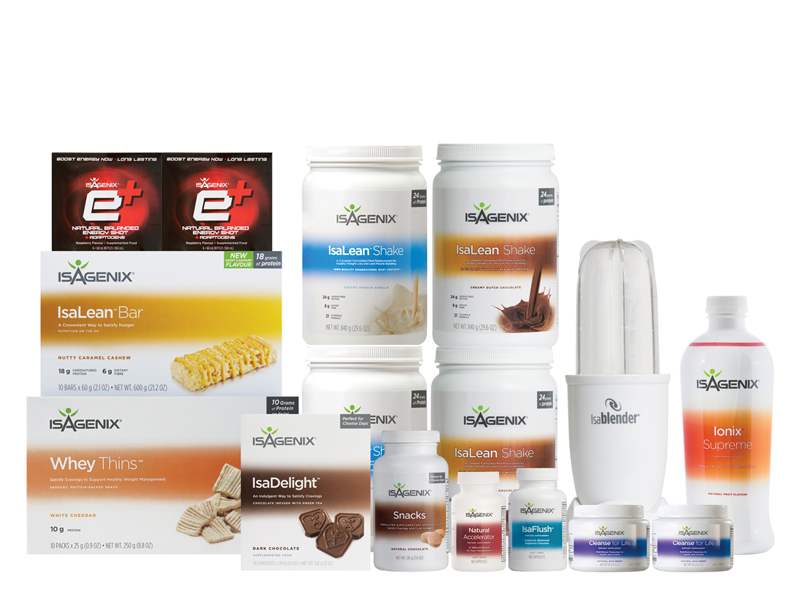 How Can You Buy the Isagenix Premium Weight Loss Pack? Offering a complete lineup of Isagenix’s top products, the Isagenix President’s Pak is an ideal way to share Isagenix products with others and jumpstart your business.